Bristol-based content marketing agency Future Content, who I'd worked with before, got in touch about their brand identity. They had an existing logo, using the geometric shape style, as well as some Google Drive presentation documents. The main issue was that the brand and associated elements lacked cohesion. Slightly different logos were being used in different places, different fonts were being used across documents and the brand lacked a creative image style. 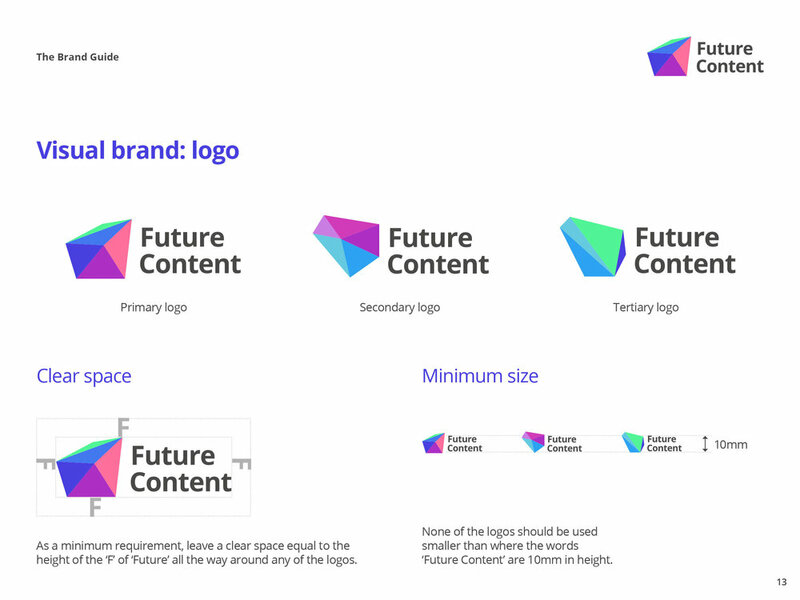 Tom and Callum from Future Content briefed me on bringing cohesion to the brand by creating a set of brand guidelines – in the process of which, I would look at creating a final set of logos, colour palette, typography rules and think about brand photography. A choice of three geometric logo icon shapes was set, along with updated typography, using the font Open Sans. Open Sans, whilst still being a sans-serif font, brought a touch of extra character to the logotype that was previously lacking. 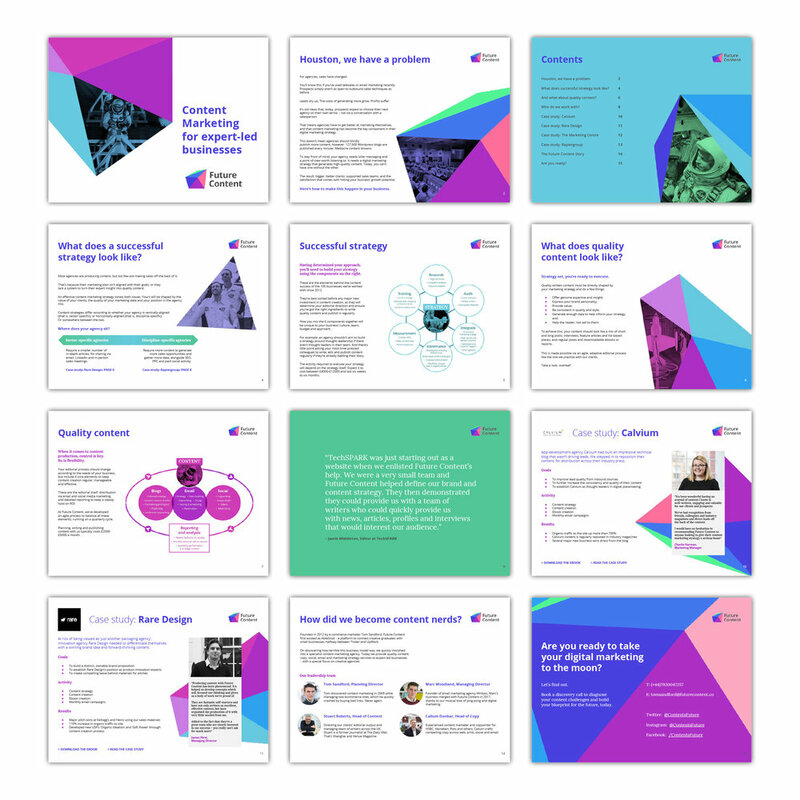 One of the deliverables during the brand design audit was an infographic to help Future Content describe their working process to their clients. Using on-brand colours and typography, I also introduced the idea of using retro black and white space / science research images to help tell the story of their working process. The retro imagery plays on the idea of ‘Future’ in the brand’s name, hinting at the theme of progression. The diagram was also split into three separate sections for ease of use in client presentations. A branded introductory presentation was designed and set up in Google Slides, with written content supplied by Future Content. Within this, rules were set for typography, image style, cover slide style, testimonial quote and end contact slide style. This was a specific presentation, but the rules were then used to set up a more generic template which could be updated by the Future Content team. Some key pages from the brand guidelines document below. These include logo, colour, typography and photography rules, as well as showing the brand in action across stationery, presentation style and company social media pages.